I have been training on the finest Rollerblade equipment and personally trained by the world’s finest inline skating instructor, Noelle Robichon the Director of Robichon’s Skating School. Noelle has had to come up with lots of original ideas for my atypical body and its asymmetries. She has taught many people ranging from beginner on up to advanced elite athletes at the highest levels of competition, many which she introduced me to, and some that I had the privilege to skate a little with. 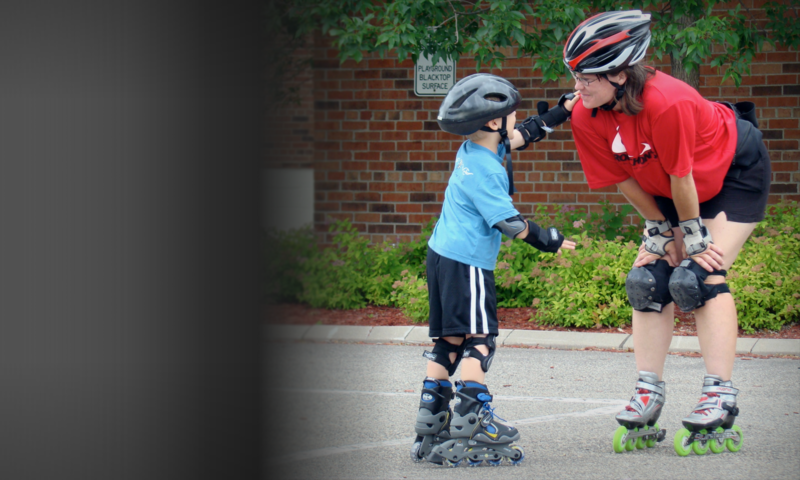 I simply believe that she is the best inline instructor in the world – innovator par excellence – bar none. She was with me the first moment I stepped on Rollerblade skates less than two months ago; we have skated for several hours nearly every other day since, and we had me ready to complete the Sixteenth Running of the world renowned North Shore Inline Marathon Race! The actual skating of the NSIM race was remarkable for me. From the very start our wave was cued by the St. Scholastica Women’s Softball team – arch rivals of my daughter Ally’s University of Minnesota Morris Women’s team – so the teasing was brilliant bliss for shaping the mood of the last half hour before we rolled across the starting line. It was at milepost three where the endorphin release was adequate to smooth out my body motions and minimize the energy expelled in catching my balance. The NSIM course has more long gradient hills than I have trained on. Everything went very well thru the sixteenth mile which in retrospect compares well with the twenty-two mile peak distance we made in training. In the race course twentieth mile my nutrition expired. Next year I will add a bread product to my morning diet which should fix that challenge – French toast seems appealing at this writing! At the twenty-fourth mile my body went into a new kind of numbness that reduced some control of my legs that was most pronounced with my right foot. I was able to work, but all concentration resources were required. On the last hill that crests at the twenty-sixth mile post our body of mine was tapped out. There is a large expansion joint at the transition from the ramp gradient to the bridge deck; at this point I was in a duck walk chatter step in our full charge to combat the gradient. I tripped on the joint and went down hard –all on the pads and no head contact. We got back up and whipped some road grit across my lower lip, licked, spit, threw my hands forward to drive our body forward into the hill crest and on into through the corner to roll down the last hill, breathing with every recovery technique I knew of to blast enough oxygen into my being and navigate the final curves gracing the harbors tranquil waters on the day. Of course Noelle was filling my mind with encouragement and technical suggestions as she skated backwards in front of me. She only spun to turn forward to grasp my outstretched hand so that we could hold hands while crossing the finish line. Noelle is an incredible sight as she dances on skates with her world renowned athleticism. There are no qualifiers or apologies necessary in calling her the world’s finest. After gathering my body in the moment again, we skated into the Exposition hall to enjoy our companions and fellow athletes. The racers food was a very generous table of prized fruits, vegetables, carbs and the starts at a big protein rebuild. After clean up and refusal to nap they called us back to the awards ceremony where Noelle and I were awarded honorary medals. Skeeter Moore, NSIM Executive Director, even insisted that we stand on the medalist podium where our audience showered us with more than generous applause and precious cheers. Yes. We did this. WE found a way to have a marathon experience with our recovery with our vessel of my body. My spirit still feels profoundly surrounded, embraced,supported and encouraged.